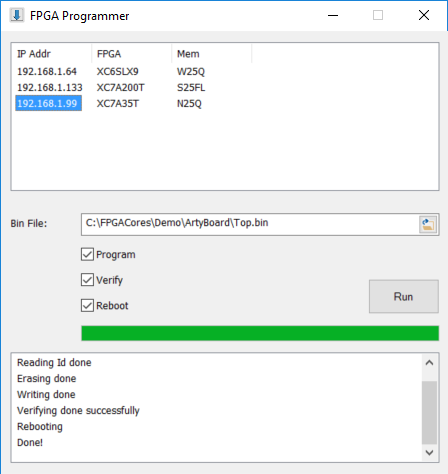 The FPGA Programmer is a tool for remote programming FPGAs that are connected to the local network. The software supports erase flash, programming, verification and rebooting. When started it automatically detects all FPGAs that are connected and supports remote programming. The detected FPGAs are displayed in a list with IP address, FPGA model and SPI flash model. All FPGAs that has the “BOOT Control” Interface are detected and supported. TCP/IP is used for communication between the FPGA and this software. Exploring and detecting connected FPGAs is using broadcast UDP. Version 1.0 supports Xilinx FPGAs with “Serial Configuration” mode. The Programmer uses “*.bin” files when programming the boot flash for Xilinx devices. Make sure that the build process generates a bin file. Open the Bitstream Settings dialog. Right click the Generate Programming File. Select the Process Properties in the popup menu. Check Create Binary Configuration File (-g Binary:).